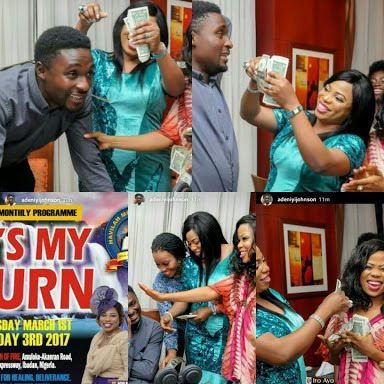 Actor Adeniyi Johnson's new lady, Seyi Edun had stated in a recent interview that a female pastor was responsible for matching them together when they both went to her mountain for prayers. She described the womanas his spiritual mother. During Adeniyi's birthday party last week, the female pastor was also in attendance and she has been identified as Prophetess Israel Ayanfe Olubori of Havilah Rosac Mountain of Fire Ministries. At his birthday dinner, Madam Israel Olubori blessed Adeniyi and Seyi with dollar.